Without question, the holidays are the craziest time of year. But it’s also when we most look forward to entertaining. Gathering a big group of friends for a casual open house is one of the season’s enduring pleasures. Unlike a formal sit-down dinner party, an open house lets people come and go as their busy schedules allow. If your group is smaller, these recipes serve 10 for a sit-down dinner. We supplemented our menu with excellent store-bought goodies, from smoked salmon and salami to cheeses and chocolates. Incidentally, our recommendations for store-bought and mail-order edibles also make very good hostess and holiday presents. Redolent of warm winter spices, this silky beef requires a bit of advance planning because you’re essentially curing the meat―but it’s very easy to do. (If you cut the marinating time to 1 day, the results will be good but not quite as silky or flavorful.) You can roast the beef up to 2 days ahead and serve it warm or at room temperature, with crusty rolls for making little sandwiches if you like. It’s also very good with a spicy-sweet chutney, such as Sukhi’s Indian-style tomato chutney or WillaBay cranberry chutney. With a menu this easy, most of the planning ahead involves buying food (and renting party supplies if you’re really having a crowd. The West teems with wonderful artisanal foods, often made in small batches by hand. Here are our picks for a holiday open-house party―all are available by mail-order, and some can also be found in local stores. The cheeses, cured meats, and chocolates may be served on platters; we’ve used several of the other foods in the above recipes. All of them make great hostess and holiday presents. We wanted the crunchiest, freshest almonds possible for the Radicchio Salad, with a bit of salty tang. The tamari almonds ($6.50 for an 8-oz. bag; 530/899-7909) from in Chico, CA, are just right. Although known for its own made-on-premises cheeses, Beecher’s Handmade Cheese, in Seattle, also sells a wide variety of other makers’ cheeses. This year it’s offering a Northwest Cheese Collection ($60; 206/956-1964) especially for Sunset readers: a hunk of mild blue Oregonzola, from southern Oregon; a wedge of the shop’s prize-winning, cheddarlike Beecher’s Flagship; sea salt-dusted, creamy yellow, soft-ripened Seastack, from the Washington coast; and firm, earthy Tumalo Tomme, aged on pine planks in the Oregon Cascades―all expertly chosen at the peak of ripeness. The assortment also comes with thin-sliced fruit-nut crostini from Anjou Bakery in Cashmere, WA. One of our all-time-favorite cheesemakers and cheese purveyors, in Point Reyes Station, CA, brings together five outstanding Northern California cheeses in its Tomales Bay Collection gift box ($65; 866/433-7834). In it are Cowgirl’s own Mt. Tam, the company’s smooth, pure-tasting best seller; salty, creamy Point Reyes Original Blue; St. George, a cheddary cheese native to the Azores and made in Santa Rosa, CA, by the Jose Matos Cheese Factory; Bucheret, a clean, sweet, melting-textured goat cheese from Redwood Hill Farm; and the stunning Jersey-milk Carmody by Bellwether Farms, which is bright yellow and has the heavenly aroma of butter and corn. The new California Artisan Cheese Guild, an organization dedicated to supporting and encouraging the California cheesemaking community, has assembled a selection of handmade cheeses exclusively for Sunset. Its California Artisanal Cheese Course ($52, including overnight shipping; or 800/591-6878) includes a wedge of Point Reyes Original Blue; a lusciously caramely Winchester Farms Gouda, made with a generations-old family recipe from the Netherlands; and a round of Cypress Grove Purple Haze, a fresh goat cheese coated with lavender and fennel pollen. The guild also throws in a jar of excellent Marshall’s Farm honey, which is very good drizzled over the Point Reyes blue. We love the of La Cañada Flintridge, CA, for its beautiful, velvety-centered chocolate ganaches and its sleek fruit- and nut-topped wafers, not to mention boxes that look like jewelry cases―designed, in fact, by the company that creates boxes for Bulgari. From $10; 818/790-7918. The most sumptuous chocolate gift box we’ve seen in years comes from master chocolatier Michael Recchiuti of of San Francisco. Called the Obsession Box ($195; 800/500-3396), it’s layered with delights such as Key lime apples―wafer-thin cross sections of Granny Smith apples dipped in Key lime juice and bittersweet chocolate; fleur de sel chocolate caramels; elegant, intense fruit gels (pâtés de fruits); and burnt-caramel almonds; plus truffles galore. We also thoroughly enjoyed the chewy wine-flavored jellies ($11; or 925/932-8300) from Cranberry Sweets of Coos Bay, OR, and in Chico, CA’s apricot almond panforte ($15 small, $31 large; 530/514-7631), a dense, tangy version of a centuries-old Italian treat. For years we’ve been fans of , out of Grand Junction, CO. A slab of this peerlessly crisp, chocolate- and nut-topped candy is a fixture of our holidays. From $17; Sunset readers get free shipping on orders placed before Dec 1, 2007―just mention the source/discount code “PRFS” when ordering; 800/367-8766. From Moscow, ID, come the delightful confections of , packaged in corrugated boxes with cut-out stars, decorated with tiny silver boots. Our favorites: sweet-then-incendiary Buckin’ Hot Habanero Caramels and the shatteringly crisp Slow Roasted Peanut Butter Brittle. From $8.95; 888/882-4098. The delicate flavors of creations never lose their appeal. We particularly like the real mint taste of the St. Helena, CA, company’s Fresh Mint ganaches, so unlike the vamped-up toothpastelike mintiness of most chocolate mints, and the warmly spiced milk-chocolate Quatre Epices ganaches. From $12; 800/966-3468. To pair with our Spiced Beef Tenderloin, we liked chunky, sweet-sour, Indian-style Sukhi’s Tomato Chutney ($4.85; 888/478-5447) from in Hayward, CA, and compotelike WillaBay Crannie Chutney ($6; 360/665-6585) from in Oysterville, WA. At in Berkeley, Paul Bertolli draws on centuries-old Italian techniques and top-quality pork to make nearly a dozen cured meats. For parties, we like to set out deep red, U-shaped salametto piccante, flavored with Spanish smoked paprika, and gently garlicky salametto, both of which are the centerpieces of spectacular small and large gift boxes (from $95; 510/526-7000) that contain delicacies like Spanish Marcona almonds and roasted piquillo peppers. Most meats―like the giant, fragrant mortadella and the spicy fresh Calabrian sausages―can also be ordered individually. For our Radicchio Salad, we picked fat, soft, glossy-skinned organic large Medjool dates ($19 for 2 lbs. ; 800/827-8017) from in Thermal, CA. Moist, firm, fat-flaked hot-smoked pepper salmon ($23 for 1 lb. 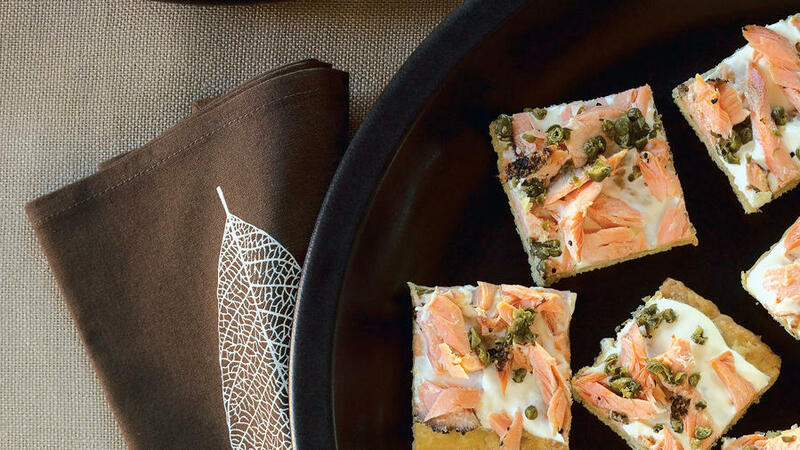 ; 800/545-2935) from Roundman’s Smoke House in Fort Bragg, CA, is our topping of choice for Smoked Salmon Canapés. makes several exceptional chutneys; its Mediterranean Tapenade ($8 for 9 oz. ; 888/627-2859), with whole capers, crushed kalamata olives, and a splash of Merlot, works very well with goat cheese on our buttery Tapenade Goat-Cheese Canapés.